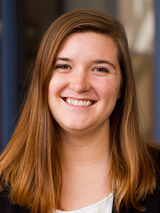 Holly Wetzel is currently the communications coordinator at the Mackinac Center for Public Policy. She interned at the Mackinac Center in 2017 before joining the staff full-time in 2018 as the communications and marketing associate. Wetzel has a B.A. in public relations with a minor in history from Palm Beach Atlantic University. Her former work experience includes an internship with the Everglades Trust and consulting on marketing with Jupiter Christian School. She grew up in Clarkston, Mich. and now lives in Midland. In her free time, she enjoys reading, playing the oboe and traveling.